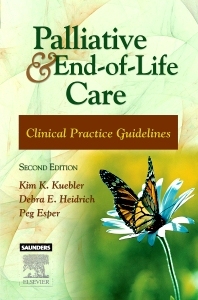 Palliative and End-of-Life Care, 2nd Edition provides clinicians with the guidelines and tools necessary to provide quality, evidenced-based care to patients with life-limiting illness. This text describes the care and management of patients with advanced disease throughout the disease trajectory, extending from diagnosis of advanced disease until death. Four units provide the general principles of palliative and end-of-life care, important concepts, advanced disease management, and clinical practice guidelines. Clinical practice guidelines offer in-depth discussions of the pathophysiology of 19 different symptoms, interventions for specific symptom management (including in-depth rationales), and suggestions for patient and family teaching. Defines dying as a normal, healthy process aided by the support of an interdisciplinary team. Provides in-depth pathophysiology, assessment, and intervention information based upon the disease trajectory. Highlights opportunities for patient and family teaching. Describes psychosocial issues experienced by patients and their families. Reviews uncomplicated and complicated grief and mourning, providing suggestions to help the family after a patient's death. Includes case studies at the end of chapters to reinforce key concepts of compassionate care.